Scars on honeydews…..are they defects? We are talking about scars, that occur while the honeydew is growing. The scars do not progress, or become worse. As you can see from the above image, I would score two honeydews as defects, damage by scars. I decided to research the USDA inspection instructions for some guidance. There is no mention of scars in their inspection instructions. After checking the U.S. Grade Standard for Honeydews I was surprised to find no mention of scarring there either. As is the rule, established by the USDA, when no specific scoring guideline is given, you should default to the guideline “if the defect materially affects the appearance, then it should be scored as damage, a defect of the U.S. No. 1 Grade.” Looking at the two melons I scored as defects, the scars obviously materially affect the appearance, right? It becomes a little more confusing if you call the scars pictured above as netting. The USDA inspection instructions do mention netting on honeydews, stating, “Netting on honeydew or honey ball type melons, either raised or occurring as shallow checks in the skin, shall not be scored as damage. Deep checks materially affecting the appearance of the melon are considered damage.” Are these considered deep checks? Unfortunately the USDA does not have any visual aids depicting netting on honeydews, specifically what are considered “deep checks.” In my 30 plus years of working with the USDA I never heard this topic come up. In the meantime, I would say it is fair to say the honeydew in the bottom left is considered light netting, and would not be scored as a defect. But if you find honeydews with netting affecting the surface in such a way the appearance is materially affected, they should be scored as defects. I have come across this. I scored it the same way. I called them scars. Tom,I always had a problem with the fact that even heavy netting is not scoreable on Honeydews. Saying that, I would not have scored any of these melons as they are to me simply covered by netting. If netting on Honeydews is not scoreable I don’t know at what point heavy netting in effect becomes or is treated as a scar. Yes, absolutley I would score these two melons as defects. Who cares what to call them, scars, cracks or deep checks. Common sense tells you they are quality defects. Good post! 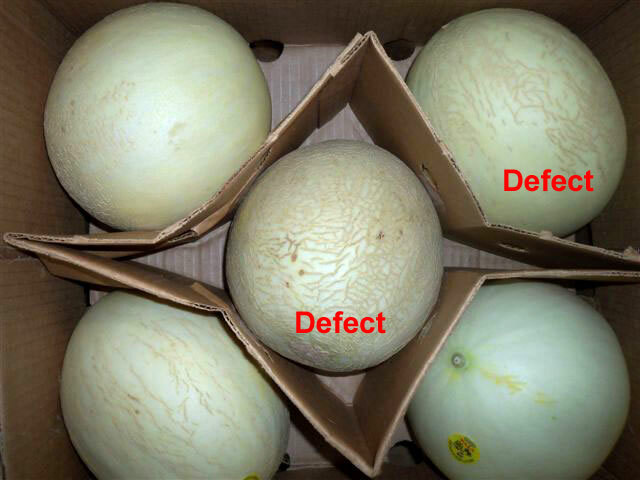 To follow up on this discussion: I reached out to many current USDA inspectors about this defect, and most everyone agreed with scoring the two melons as a defect. There were many opinons as what to call the defect; scars, netting, or surface cracks. Surprisingly there were a few USDA inspectors that would not score any of the melons shown above as a defect, citing the inspection instructions stating “not to score netting unless it they are deep checks.” They explained they have never been shown a visual aid depicting a melon with netting that is so severe to be scored as a defect. Hopefully the USDA will look into this problem, as there is definite confusion among the USDA inspectors.